For those who love leather, the Phantom LE sandals are a mix of classic and classy. The soft, comfortable leather upper with air mesh lining is perfect for when your beach day flows right into happy hour and then a night out. These men’s sandals feature a contour compression molded EVA footbed, anatomical arch support with grippy molded high-density EVA outsole, and all the durability and traction you’ve come to know and love from the Phantoms, just upgraded with leather. 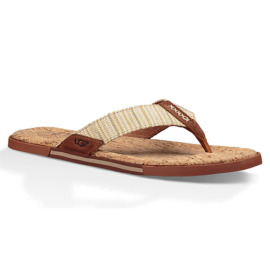 This easy style elevates your classic flip flop with rich leather and a soft cork insole. The Braven Diego exudes West Coast vibes with its bright patterns. Featuring a soft cork insole and durable outsole, these flip flops are next-level.